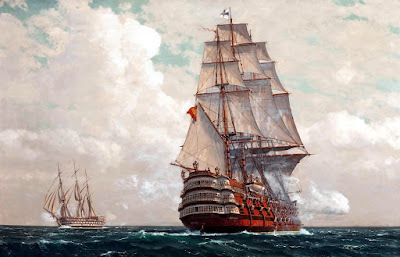 In the previous post I included a number of infographics of various types of warships from the Age of Sail, the period lasting from the 16th to the mid-19th century where naval warfare was dominated by sailing ships armed with cannons. In this post I will describe briefly some of the the largest, most powerful and advanced warships of that era. 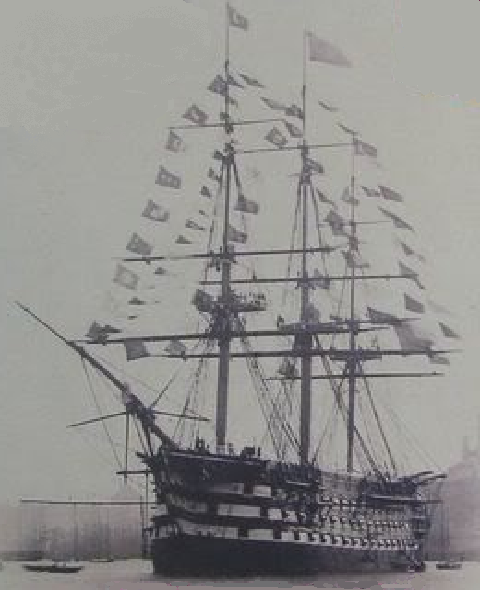 HMS Victoria was the last British wooden first-rate three-decked ship of the line commissioned for sea service. With a displacement of 6,959 tons, she was the largest wooden battleship which ever entered service. 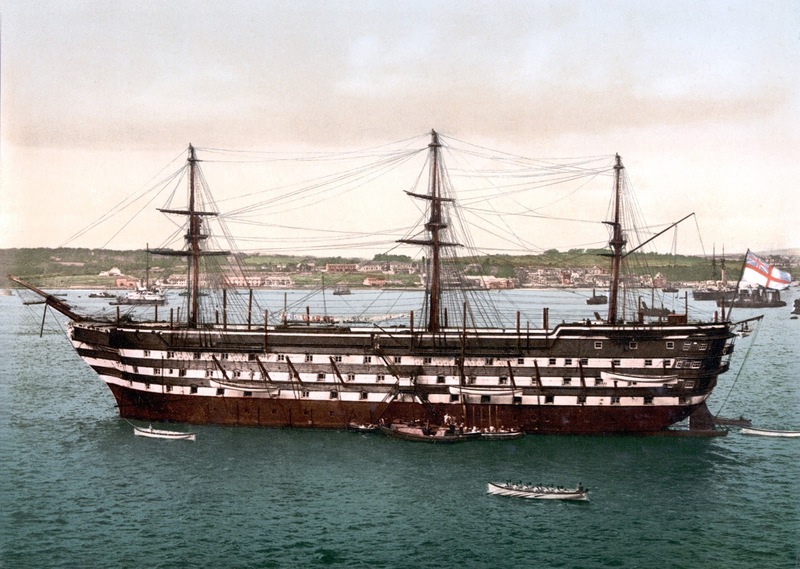 She was also the world's largest warship until the completion of HMS Warrior, Britain's first ironclad battleship, in 1861. Victoria´s hull was 79.2 metres (260 ft) long and 18.3 metres (60 ft) wide. She had a medium draught of 8.4 metres (27.5 ft). Her hull was heavily strapped with diagonal iron riders for extra stability. Victoria was the first British battleship with two funnels. She was armed with a total of 121 guns (32 8-inch smooth-bore muzzle-loading guns on the lower gun deck, 30 8-inch (200 mm) guns on the central gun deck, 32 32-pounders on the upper gun deck, 26 32-pounders and one 68-pounder on the upper deck). 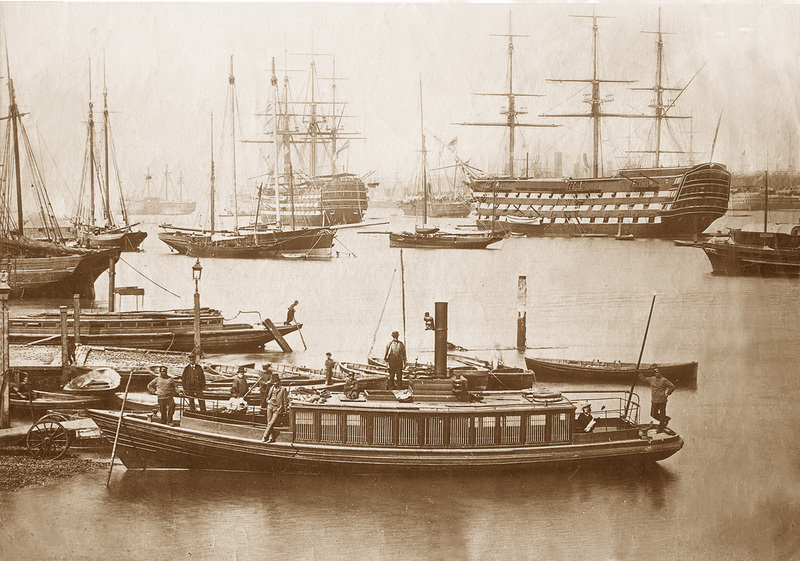 Victoria was ordered on 6 January 1855, laid down on 1 April 1856 at Portsmouth, and launched on 12 November 1859. She cost a total of £150,578 (2010: £11,764,000) and had a complement of 1,000. During trials in Stokes Bay on 5 July 1860 Victoria reached a top speed of 11.797 knots (21.848 km/h), making her the fastest three decker worldwide, along with the French Bretagne. 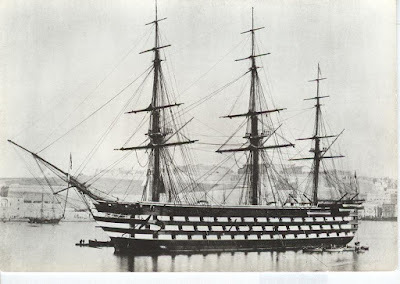 HMS Howe, Victoria´s slightly enlarged sister ship, was built as a 121-gun screw first-rate ship of the line of the Royal Navy. She and her sister HMS Victoria were the first and only British three-decker ships of the line to be designed from the start for screw propulsion, but the Howe was never completed for sea service (and never served under her original name) as she had already been made obsolete by the first ironclad battleships. The highest number of guns she ever actually carried was 12, when she finally entered service as the training ship Bulwark in 1885. Howe was named after Admiral Richard Howe. 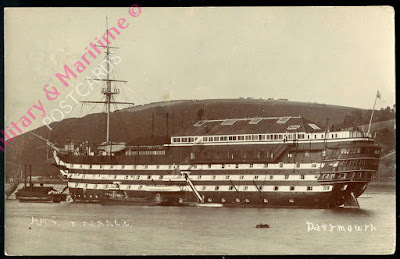 She was renamed a second time to Impregnable on 27 September 1886, but reverted to Bulwark in 1919 shortly before being sold for breaking up in 1921. 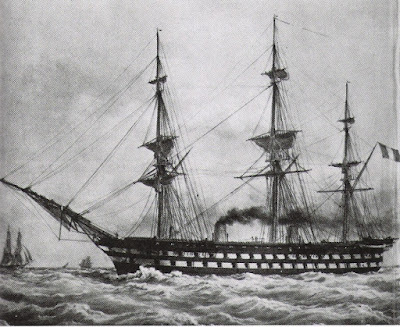 HMS Duke of Wellington was a 131-gun first-rate ship of the line of the Royal Navy. Launched in 1852, she was symptomatic of an era of rapid technological change in the navy, being powered both by sail and steam. 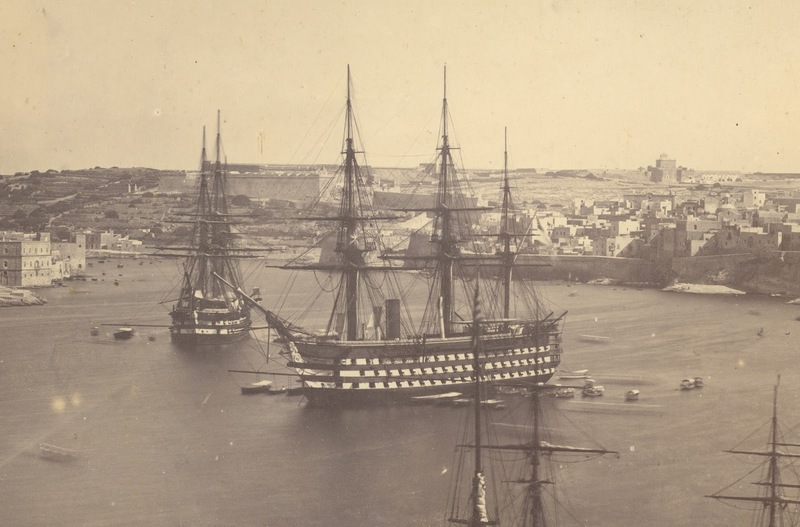 First christened HMS Windsor Castle, she was the first of a class of four that represented the ultimate development of the wooden three-decker ship of the line which had been the mainstay capital ship in naval warfare for 200 years. 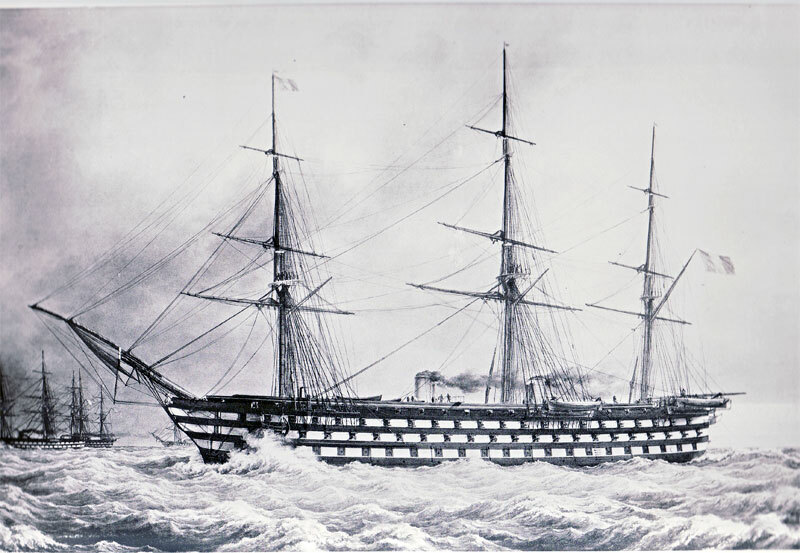 After receiving screw propulsion during her construction the ship was launched on 14 September 1852. On that day the Duke of Wellington died, and she was subsequently re-named in his honour and provided with a new figurehead in the image of the duke. 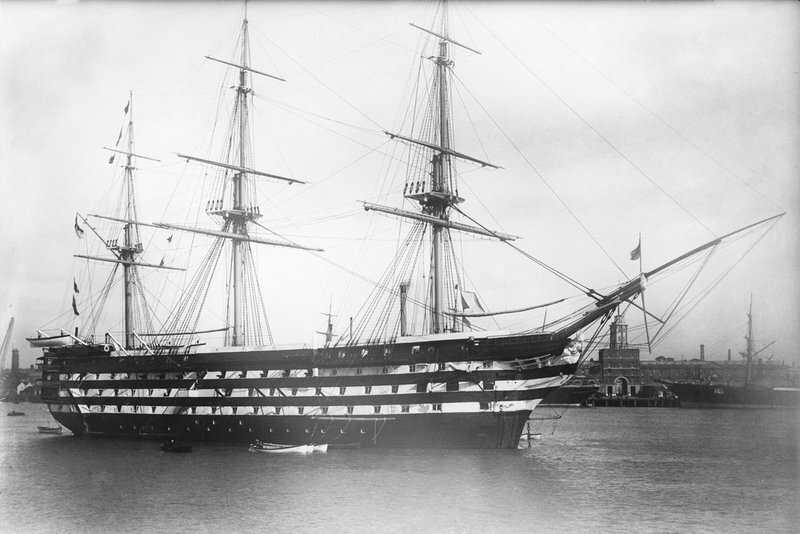 When completed on 4 February 1853, HMS Duke of Wellington was, on paper at least, the most powerful warship in the world (and would remain so until the completion of the French Bretagne in 1855) and the largest yet built for the Royal Navy, twice the size of Nelson's HMS Victory and with a far bigger broadside. She was 240 feet (73.1 m) long, displaced 5,892 tons, and carried 131 cannon, weighing a total of 382 tons and mainly firing 32 lb balls. 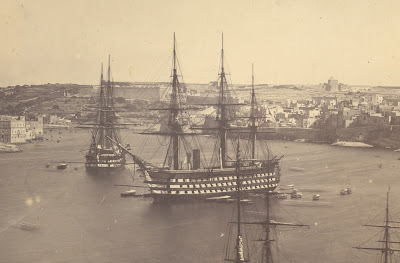 of Valletta, Malta, sometime between 1858 and 1864. 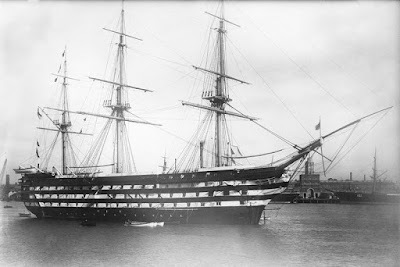 HMS Marlborough was completed to a modified design and served as flagship of the Mediterranean Fleet from 1858–64; thereafter she too was a receiving ship at Portsmouth, renamed Vernon II, surviving until broken up in 1924. HMS Prince of Wales was completed to the same design as Marlborough in 1860 but saw no sea service; in 1869 she was renamed HMS Britannia and became the stationary training ship for officer cadets on the River Dart. 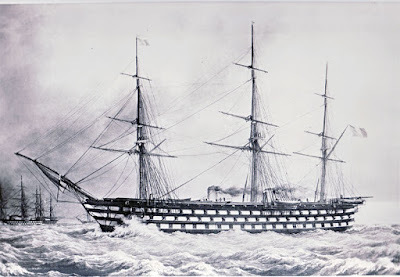 HMS Royal Sovereign was completed to the same design as the Duke of Wellington but was cut down to the lower deck and converted in 1862-4 into the first British turret ship to try out the ideas of Captain Cowper Phipps Coles. She was fitted with four turrets mounting 9 inch muzzle-loading rifled guns. She was regarded as primarily experimental and her longest voyage was to Cherbourg in 1865 before becoming the tender to the gunnery school HMS Excellent. 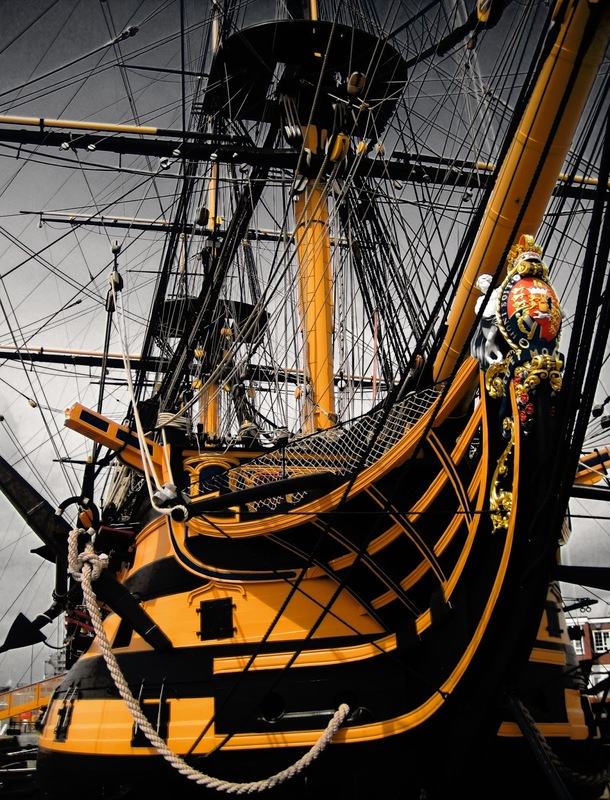 HMS Victory is a 104-gun first-rate ship of the line of the Royal Navy, ordered in 1758, laid down in 1759 and launched in 1765. She is best known as Lord Nelson's flagship at the Battle of Trafalgar in 1805. 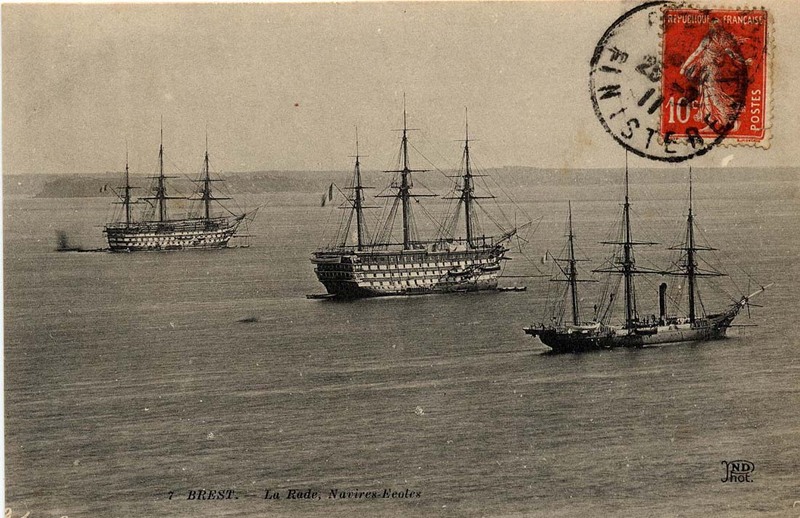 She was also Keppel's flagship at Ushant, Howe's flagship at Cape Spartel and Jervis's flagship at Cape St Vincent. 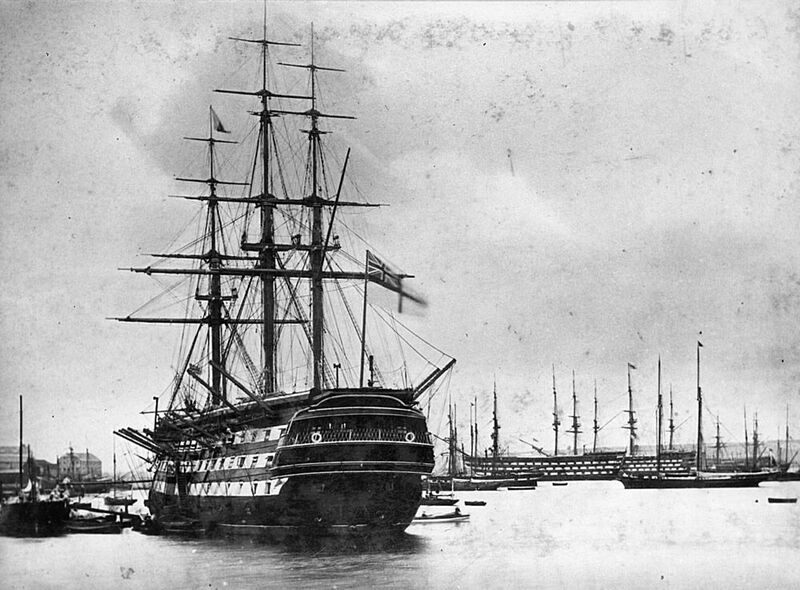 After 1824, she served as a harbour ship. In 1922, she was moved to a dry dock at Portsmouth, England, and preserved as a museum ship. She has been the flagship of the First Sea Lord since October 2012 and is the world's oldest naval ship still in commission. HMS Victory is about 70m long and she has a displacement of 3,500tons. 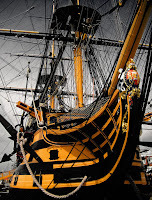 A great look inside HMS Victory can be found here as well as in this excellent article. 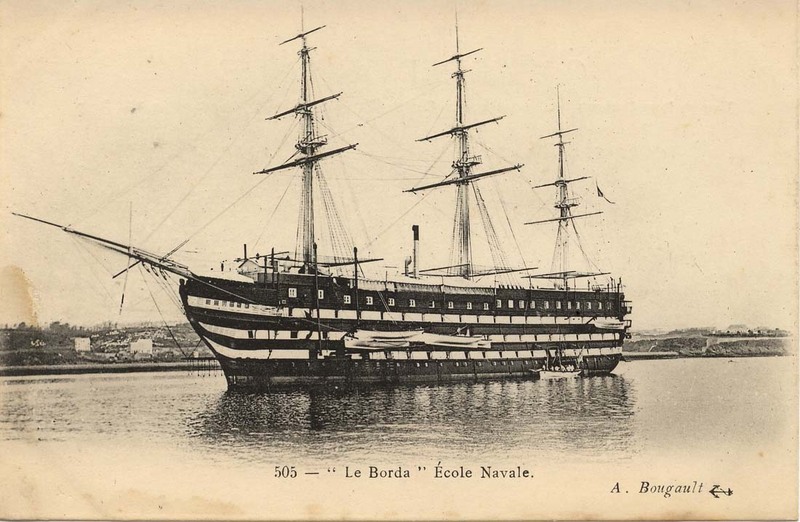 La Borda and other French naval vessels in 1887. Notice the ship's vertical lines. 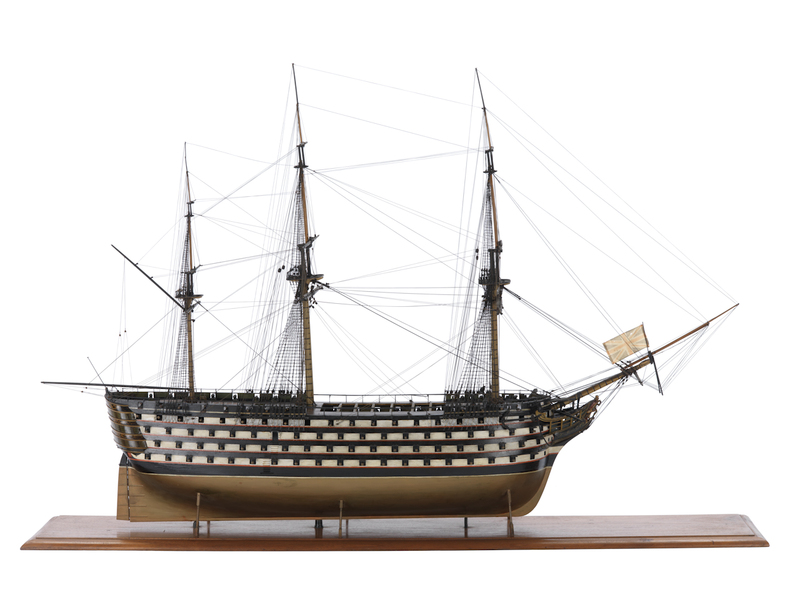 The Valmy, named after the Battle of Valmy, was the largest three-decker of the French Navy, and the largest tall ship ever built in France. 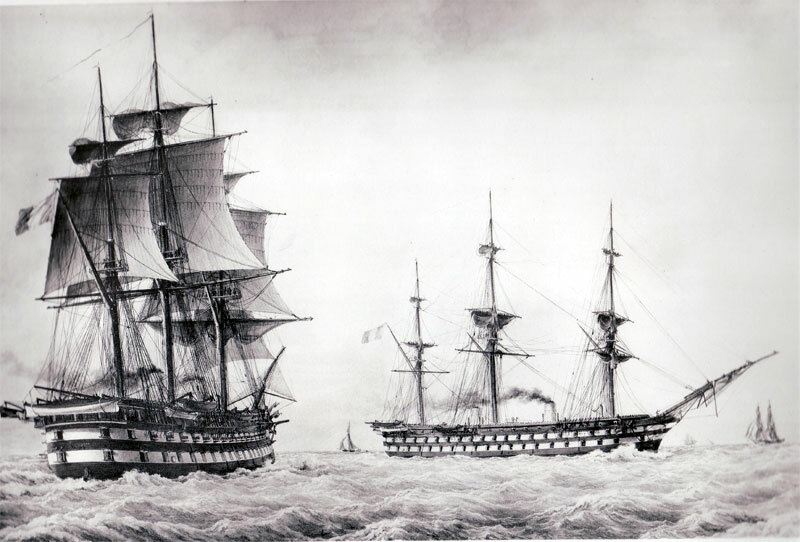 Valmy was laid down at Brest in 1838 as Formidable and launched in 1847. 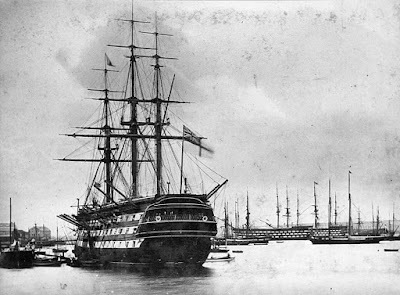 When she entered service in 1849, she was the largest warship in the world and would remain so until 1853, when the British three-decker Duke Of Wellington (6,071 tons and converted to steam power while on the stocks) entered service, but she would remain the largest sailing three-decker ever built. Unlike most similar ships, that featured a pronounced tumblehome, she had vertical sides; this significantly increased the space available for upper batteries, but reduced the stability of the ship; wooden stabilisers were added under the waterline to address the issue. 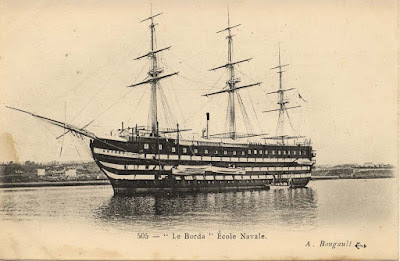 She was used as a school ship for the French Naval Academy from 1864 under the name Borda. She took back her old name of Intrépide one year before being stricken from the navy list in 1891. Valmy was 64m long, she displaced 5,826 tons and she was armed with up to 120 guns. The Bretagne was a fast 130-gun three-decker of the French Navy, designed by engineer Marielle. She was built after the Napoléon, and was fitted with a steam engine while under construction, though she had been laid down as a sail ship. 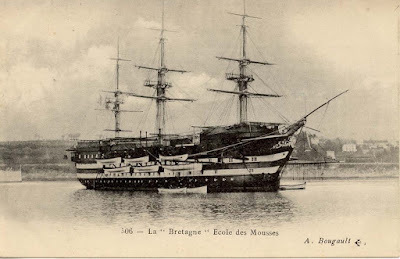 Bretagne served as a floating barracks from 1866 until 1879 when she was scrapped the next year. 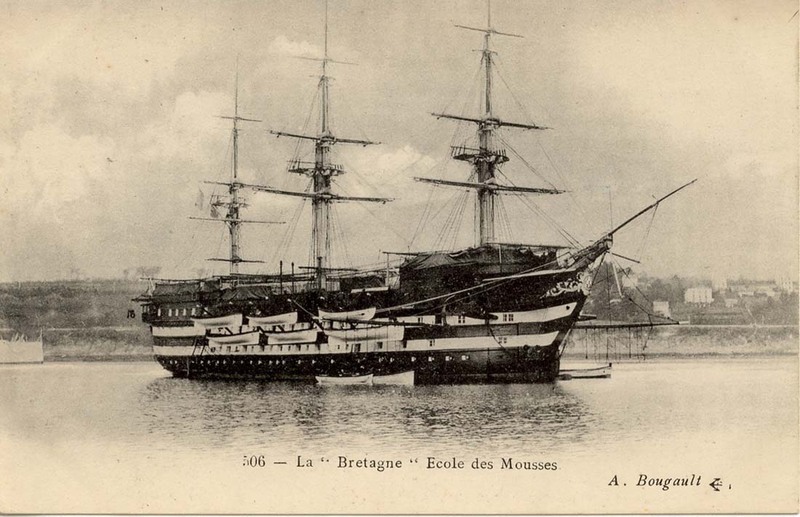 Bretagne was 81m long and her displacement (full) was about 7,000 tons. 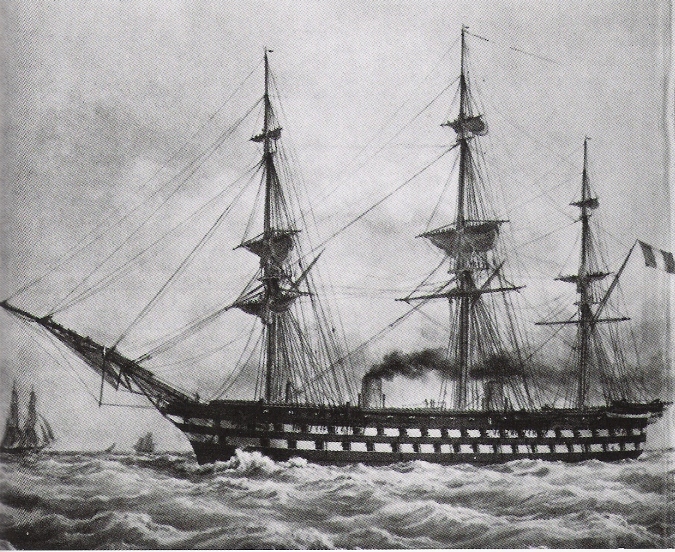 The Napoléon was a 90-gun ship of the line of the French Navy, and the first purpose-built steam battleship in the world. She is also considered the first true steam battleship, and the first screw battleship ever. Launched in 1850, she was the lead ship of a class of 9 battleships, all built over a period of 10 years. This class of ship was designed by the famous naval designer Henri Dupuy de Lôme.The ship displaced 5,120tons and her length was 77.8m. 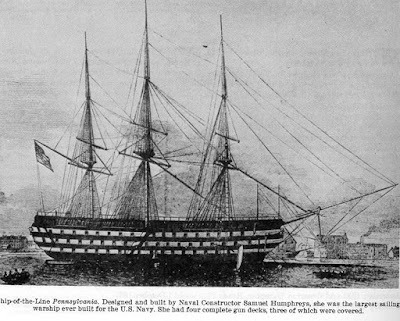 USS Pennsylvania was a four-decked 140-gun ship of the line of the United States Navy, named for the Commonwealth of Pennsylvania. 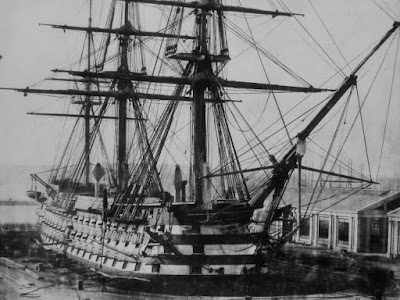 She was the largest sailing warship ever built for the United States, the equivalent of a first-rate of the British Royal Navy. Authorized in 1816 and launched in 1837, her only cruise was a single trip from Delaware Bay through Chesapeake Bay to the Norfolk Navy Yard. She remained there until 20 April 1861 when she was burned to the waterline to prevent her falling into Confederate hands. The ship displaced more than 3,100tons and its length was 64m. Mahmudiye was a ship of the line of the Ottoman Navy. She was a three-masted three-decked 128-gunned sailing ship, which could perhaps be considered to be one of the few completed heavy-first rate battleships. Mahmudiye, with a roaring lion as the ship's figurehead, was intended to serve to reconstitute the morale of the nation after the loss of the fleet at the Battle of Navarino in 1827. 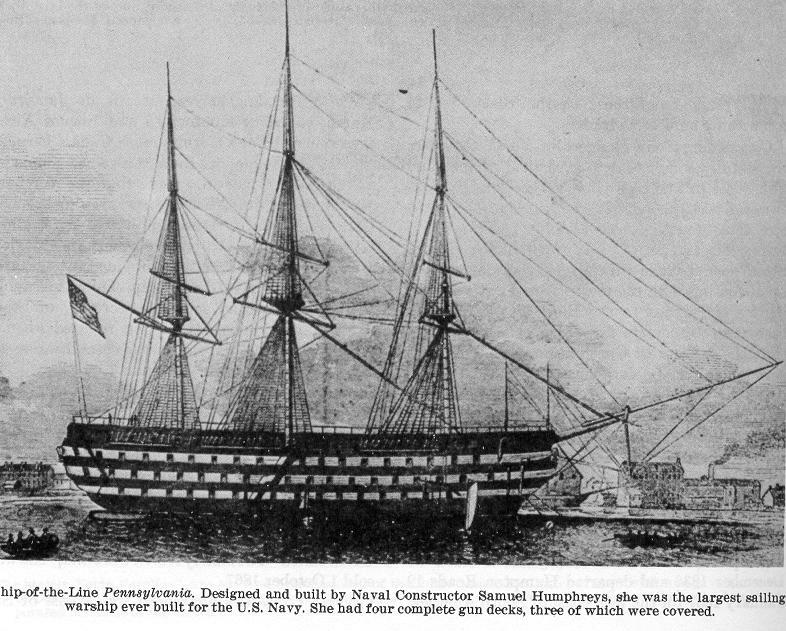 The flagship was for many years the largest warship in the world. 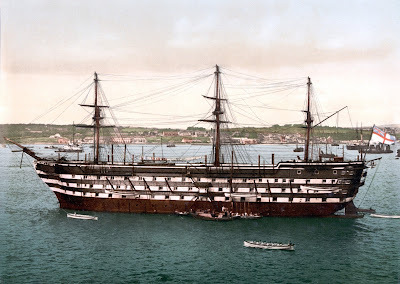 She was constructed by the naval architect Mehmet Kalfa and the naval engineer Mehmet Efendi on the order of Mahmud II (reigned between 1808–1839) at the Imperial Arsenal, on the Golden Horn in Constantinople. 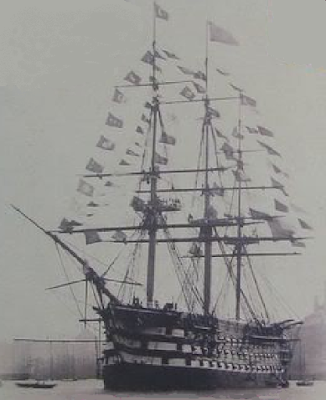 The 76.15 m × 21.22 m (249.8 ft × 69.6 ft) ship of the line carried 1,280 sailors on board. With the introduction of steam power at the end of the 1840s, the conversion of the pure sail-driven ship into a steamer was considered. However, the lack of the necessary space for the steam engine on board meant the idea could not be realized. 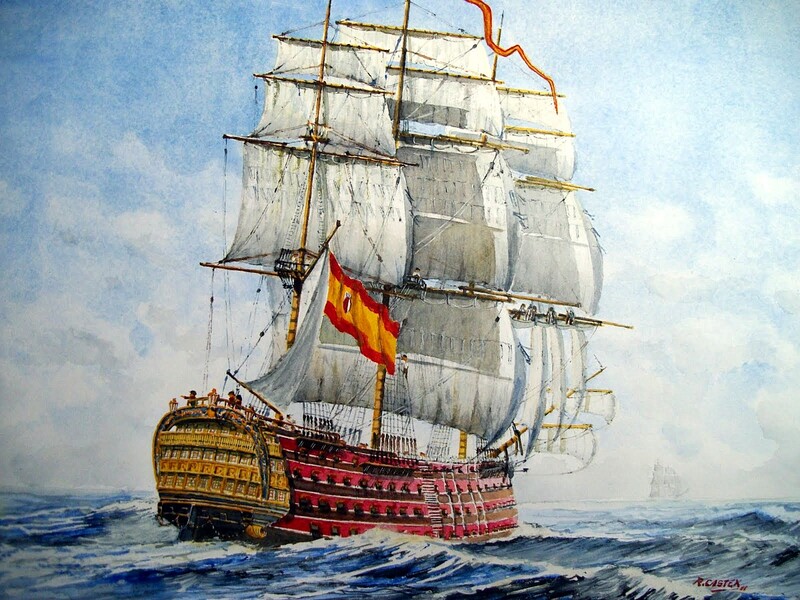 The Santísima Trinidad (officially named Santísima Trinidad by Royal Order on 12 March 1768, nicknamed La Real) was a 4,950 tons Spanish first-rate ship of the line of 112 guns, which was increased in 1795–96 to 130 guns by closing in the spar deck between the quarterdeck and forecastle, and around 1802 to 140 guns, thus creating what was in effect a continuous fourth gundeck although the extra guns added were actually relatively small. 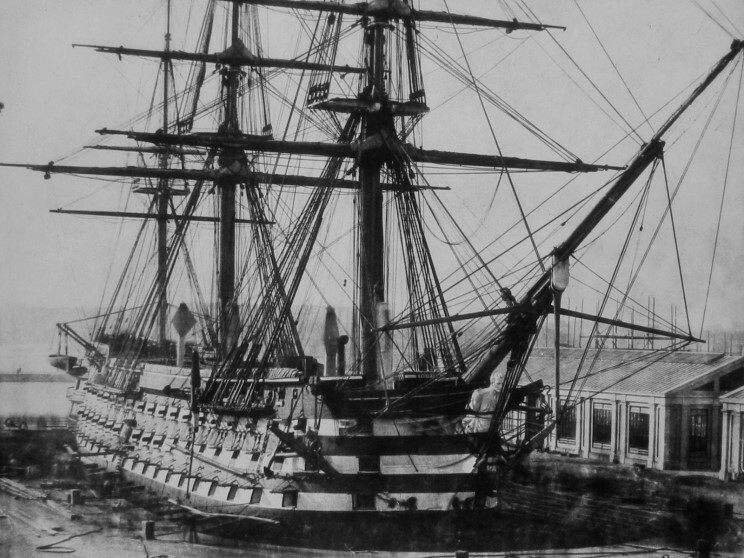 She was the heaviest-armed ship in the world when rebuilt, and bore the most guns of any ship of the line outfitted in the Age of Sail. As the only ship with four gun decks, she was reputed to be the largest warship in the world, for which she was nicknamed El Escorial de los mares by the Spanish, until surpassed in sheer size by the new type French 120-gun ships such as the Océan (1790). The weight of the additional guns, so high above her waterline, made her sail poorly, leading to her nickname, El Ponderoso. It was even suggested by some naval officers that she should be restricted to defending the Bay of Cádiz. 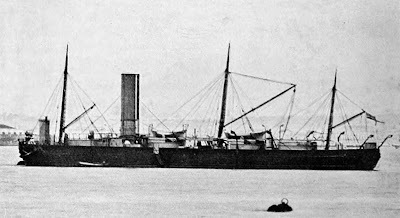 Santísima Trinidad remains famous as one of the few four-decker ships of the line ever built. The U.S. Navy constructed the four-deck, 136-gun Pennsylvania and the 120-gun French - Valmy (both with similar flush deck arrangement), and the Royal Navy planned—but did not actually build—the proper 170-gun four-decker Duke of Kent. It's believed that the wreck of Santísima Trinidad was found by coincidence during testing of a new sidescan sonar of the Spanish Navy, in 2009.